For the last month, we have been on lice alert here. My eldest child is 6, and her class is infected. Someone, thankfully, recommended Fairytales Repel Shampoo. Hopefully, we will win this war...because I am getting really tired of washing all the things. My mom took the kids to Ulta to pick up some of this magic goo for her house, and of course my lovely girls had to have some nail polish while they were there. And because I am raising them right, they both picked Orly polishes. I has a proud. Charlie's color of choice is first. It's a lot less pink than I would have predicted for her. I loved it at first sight. 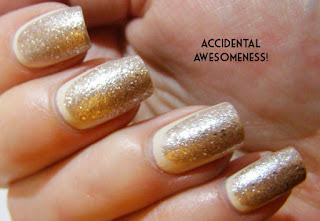 I wish I had this polish for this manicure, it would have been perfect. 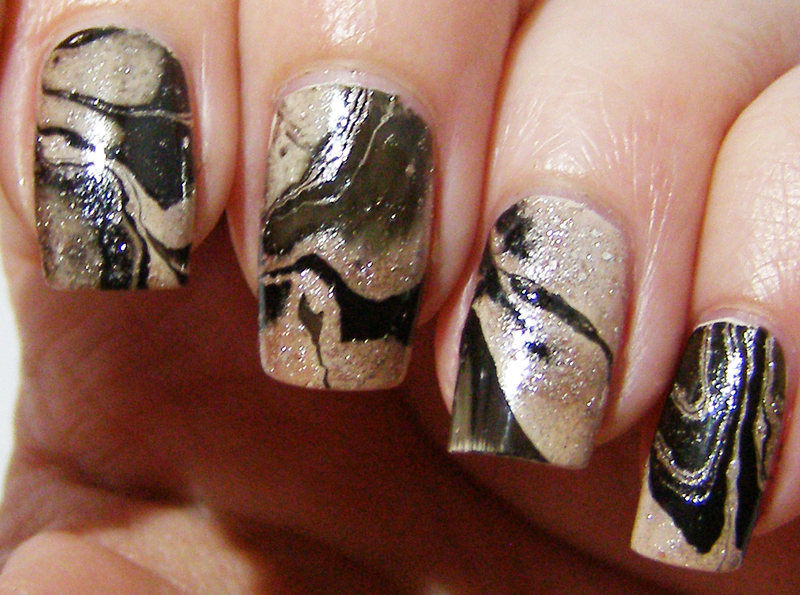 I decided, against the advice of Amanda, to try a water marble with the super glitter. Kind-of a bad idea. a bit of blur here. Sorry. I'm learning. It turned out ok. Not what I was going for at all. I didn't hate it, but I certainly wasn't going to waste my time trying it on lefty. That's just silly. So, for the hell of it, I decided to attempt a ruffian manicure. HOLYCRAPIGOTITONTHEFIRSTTRY. It was the easiest thing ever. I must try this again and again. I kinda love it. I've always oogled this manicure on other people, but assumed it was too difficult for someone with a short attention span like me. I was wrong. If you can hold a brush mostly steady, you can do this. Try it. Please. You won't be sorry. I'd love to see some pictures posted to our facebook if you try it. new camera makes it very hard to snap a picture of lefty. I also think this is a pretty SFW manicure. I tried *everything* when I had lice at 17. Went my whole childhood without getting them, then almost celebrated my 18th with them. Thanks, kid who infected me.